Recently I read a post by Larissa Pahomov where she talks about having a Phd student observing her English class over an entire year. She reflects on this experience here but what I struck me most, was the realisation that her students were not on the same page. What a wake-up call. Today I am really thinking about what’s “clear” to me but opaque to students — and therefore only happening in my head. As a teacher of students with diverse learning needs in a Special Unit, it is essential that I know my students extremely well. I need to know their interests, their understanding, their emotional capacity to be challenged and their best coping strategies, ways to capture their imagination, ways to present information so they have access and best approaches to make links to their prior understanding because learning is HARD! I love this challenge. I am driven to find the best way to connect their lives to their learning, to make it real, to foster their success and increase their resilience. Of course there are times that I feel I am not there yet, and I have students for whom I am still striving to find the best ways to connect their learning. I do my utmost not to make assumptions about my students understanding. I constantly check through different levelled questioning, 1:1 reflections, discussions, responses and other opportunities to show their learning. So through this constant checking, I feel I avoid the “wake-up” call. I avoid discovering down the track that I “missed the boat” completely. So now I ask myself – If I am so diligent with this in my classroom, then why is it that I am not doing this for my peers as I try to engage them in our learning journey to improve Teaching Practice? Recently I have been engaging staff at my school to build relationships with their students, to get to know them better. I provided research addressing the impact that teacher/student relationships have on learning and engagement, so they understood why this is a focus. I THOUGHT they were “getting it”, I ASSUMED we were on the same page, that we are at a point where we all can agree that relationships matter, that understanding that students come into our class with more than just a bag full of books is vital. I set my peers a task. I asked that they engage in an activity with their classes that promotes sharing, that provides information about their interests, abilities, frustrations and more. I created examples myself, my Assistant Principal created some fantastic examples for me too. 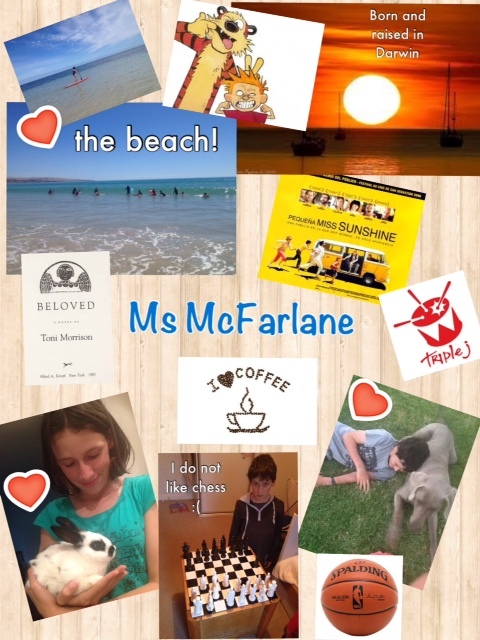 I tried to provide a huge range of options and include both digital and non-digital options including HaikuDeck, About Me Posters (examples included using Pic Collage App, postermywall.com and a traditional collage), Google forms, Parking Lots, writing letters/emails, posting comments(examples included traditional post it notes and wallwisher.com), vision boards, goal setting (examples included using popplet app and mind-mapping), graffiti walls (http://graffiter.com/app) comic strips (examples included comic strip app, http://chogger.com/creator http://www.stripcreator.com/ and paper templates), word clouds and animations. 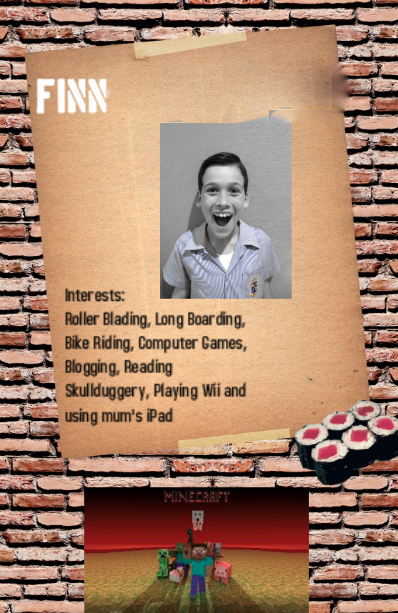 This is a profile poster created online.. This is a collage based on my interests using my iPad…. So here I was thinking… they understand WHY it is important to connect, I have provided them with tools HOW to go out and be successful, they just have to do it right? Not quite! Some did “get it” but honestly, they probably got it before, I just provided them with a new way to engage their students. Some just saw it as a task, an activity and didn’t see that it wasn’t just something to get the kids to do for the sake of doing it, but to give something of themselves and use what the students gave as an opportunity to connect, to build on. So what is clear to me – that we need to teach kids first and curriculum second, is opaque to many. Some of my peers still see their job as “delivering the curriculum”. My challenge is to help them understand, our work is FAR more important than that! If we are to embrace the notion that the purpose of school is to help students to become critically aware, fully realized citizens, then let us understand the skills that must then follow, and let us then rethink our schools and our curriculum and our assessments in an attempt to build the systems and structures that will help our students achieve those goals.. Thanks for reading, I would love to hear any ideas to help support teachers see their true worth. If I Were a Teacher….